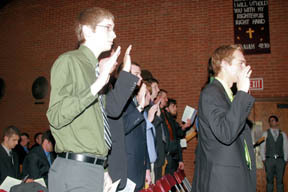 The Pledge of the Computing Professional entails a rite-of-passage ceremony for graduates from computing programs. I am a Computing Professional. My work as a Computing Professional affects people’s lives, both now and into the future. As a result, I bear moral and ethical responsibilities to society. As a Computing Professional, I pledge to practice my profession with the highest level of integrity and competence. I shall always use my skills for the public good. I shall be honest about my limitations, continuously seeking to improve my skills through life-long learning. I shall engage only in honorable and upstanding endeavors. By my actions, I pledge to honor my chosen profession.